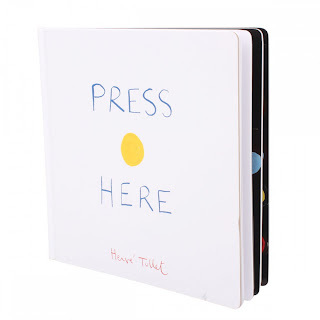 Press Here by Hervé Tullet is one of the most innovative, clever and sophisticated children's books published in recent years. Books can't get more interactive than this, yet it has absolutely no gimmicks, sounds or batteries in it. Pure paper. And imagination. Lots. 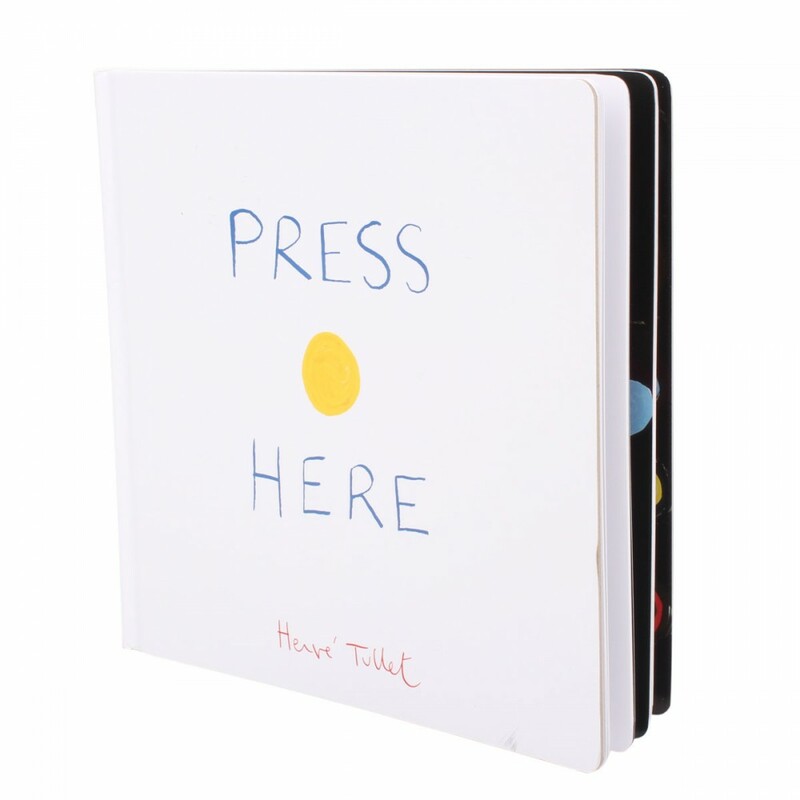 It starts off with a blank page and a yellow dot in the middle of it and invites you to "press here and turn the page". And the magic starts. On the next page, there are two yellow dots, and we are invited to press again and turn. The next page shows three dots. Here we are invited to rub one of them gently and turn the page, to discover we've made it go red. Over the next pages we are invited to tap a dot and turn the page (to discover our taps have generated a tower of dots), to shake the book and turn the page (to discover we've made all the dots move about the page), to press down hard on all the yellow dots (to discover on the following page we've made the light go off and it's all black), to blow hard "to get rid of the black", to clap and make the dots grow, and grow and grow, until we eventually end up with a white background and yellow dot again and are invited to do it all over again. Sheer genius. And a great little techno-generation joke. The publisher's own book trailer is probably the best way to explain what it is and what it does! Press Here touches on two main philosophically interesting issues, namely, causality and the paradox of fiction. Two thematic blocks of questions to prompt debate among children follow, with a very brief and general, non-specialised and name-free background introduction to each of them for teachers / parents / grandparents / anyone out there interested. The paradox of fiction refers to people being "moved" (normally emotionally) by fictional characters, events or situations despite knowing that they are fictional and not real. How can we explain that we feel sad for a character in a book even though we know that they do not really exist? Or that we feel frightened by a monster in a film, despite knowing that no such monster exists? Or, in the case of Press Here, that we reach out and press, or blow, or clap, despite knowing that we are not really making anything happen when we do so? Philosophers of art have tried to explain this paradox in different ways. Some have suggested that, with fiction (at least with good fiction), we enter a special state whereby we willingly suspend disbelief and -at least momentarily- embrace it as "real". Others suggest that it's not entirely accurate to say we are moved by fictional characters or events. When we say we feel sad for a character in a book, what we are really saying is that we feel sorry for people in real life who could be in that situation or in a similar situation. Others suggest that it is another form of "pretending" or make-believe (that is, we don't "really" feel sad or frightened, we are just pretending). Press Here is interesting in this way, because, although not strictly emotionally, it does move us in a very clear way, to take part and engage in the illusion that we are making things happen in the book, even though we know very well we are not. And this does not only happen the first time we read it. It happens again and again every time we look at it. Is Press Here different from other books you have read? In what ways? What makes it different? What do you like about it? Who makes things happen in the book? Is Press Here like magic? Did you laugh while you were reading it? What do you think made you laugh? How hard did you blow on the black to get rid of it? How did you feel when you turned the page and saw that a lot of the black was gone? If you know that it's not you making things happen, why do you do it? What makes you continue doing it? Is Press Here a book or a game? Why? Are all books a kind of game? Press Here plays with the assumption that our actions are "causing" things to happen; that when we press a dot, we make it duplicate, that when we blow, we get rid of the black, that when we clap, we make the dots grow, etc. In doing so, it raises timeless philosophical questions regarding causality. 1a. When you press the yellow button on the first page of Press Here, it turns into two on the second page. By pressing it, do you cause the one yellow button to turn into two? 1b. When you press a doorbell, it rings. By pressing it, are you causing the doorbell to ring? 1c. What is the difference between the two cases above? What is it that makes us say that in 1b there is a cause-effect relationship between pressing the doorbell and it ringing, whereas in 1a there is no cause-effect relationship between pressing the button and it turning into two? 2. How can we know when two things are linked through cause and effect? If you pressed a doorbell and you suddenly felt ill, would you think it was an effect of having pressed the doorbell? Why? 3. Does experience of seeing two events occurring one after the other again and again confirm that there is a causal link between them? How many times do you think you have to see two events together to conclude there is a causal link between them? 4. Can you think of two things that always "go" together but do not have a causal link between them? The philosophical questions raised by Press Here are quite abstract and may suit slightly older primary school children. Younger children will still enjoy thinking about some of the questions about the paradox of fiction though. Remember that the idea here is to use this as a very rough guide for a lively child-led discussion about the book. Let them lead and you follow their flow! Enjoy! And leave a comment telling me how it went if you used any of the above material. Read more about the idea behind these picture book reviews for philosophical discussion among children here and about some proposed general "discussion rules" for facilitators and participants, here (coming soon). (c) of text, Ellen Duthie. You may copy this or reproduce it, but please be nice and credit the author and site.